A man has been shot in both legs in what police have described as a “vicious and brutal” paramilitary style attack in west Belfast. Detectives investigating the Saturday evening attack are appealing for witnesses and information. Detective Sergeant Armstrong said: “We received a report around 8:05pm from the Northern Ireland Ambulance Service that a man had been shot in both legs in the Ardmonagh Parade area. “The man was subsequently taken to hospital for treatment of the injuries to his lower legs that resulted from the shooting, which is believed to have occurred around 7:55pm. “This was a vicious and brutal attack at a time in the evening when families were going about their business. The very fact that whoever pulled the trigger thought it was acceptable to recklessly shoot this man in a built-up area where children and teenagers could be passing by shows the contempt they have for their community. The bullets could have strayed at any moment and hit someone passing by. “Anyone who witnessed this shooting would have been petrified, including the victim himself. This is not what we want in our communities. 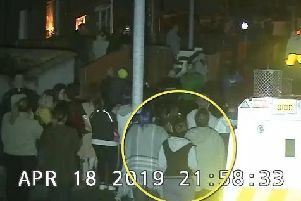 The PSNI asked for anyone who was in the Ardmonagh Parade or Norglen Parade areas last night, or if they know anything about this incident, to call detectives at Musgrave on 101, quoting reference 1162 of 23/03/19. Alternatively, information can also be provided anonymously to the independent charity Crimestoppers on 0800 555 111. Meanwhile, police have been processing a range of suspects arrested during anti-paramilitary raids on Friday. Four men aged 22, 27, 29 and 38, who were arrested during a search by the Paramilitary Crime Task Force on Friday in the Greater Belfast and Ards areas have been charged with offences including the supply of a Class A controlled drugs. Four other men aged 32, 47 and two aged 48, have also been charged with supplying Class A drugs. A 34-year-old man has been charged with unlawfully obtaining of/disclosure of personal data to appear at Belfast Magistrates’ Court on 18th April. A 32-year-old man arrested on suspicion of possession of a Class A controlled drug with intent to supply was released on bail pending further enquiries. And a 40-year-old man arrested on suspicion of possession of a Class B controlled drug, intimidation and improper use of electronic communications has been released, to be reported to the Public Prosecution Service.